Crystal is the graphic designer for Alison & Ivy, a custom jewelry manufacturer in Chicago. She was working on their product catalog and had read "The Designer’s Guide to Inkjet" book, so she had a couple of questions about printing this release with high-speed aqueous inkjet. It wasn't variable content or the desire to be different that drove Crystal toward inkjet printing. 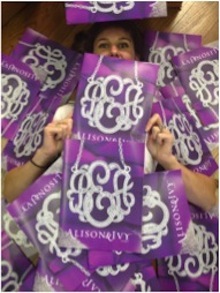 She needed 1,000 catalogs for a Las Vegas trade show that was fast approaching and wanted to reduce the cost. Ordinarily, Crystal would opt for offset printing, but a broker suggested high-speed inkjet as an option to reduce the per-piece cost. We talked about how important the paper would be when printing inkjet. I encouraged her to bring a sample sheet of the book or a fingerprint containing important color and print quality elements prior to production to establish expectations. After all, I told her, inkjet will look different. Since her catalog contains highly detailed items, I underscored the importance of using quality paper. Also, since the piece was not initially designed for inkjet production, highly detailed images needed to be enhanced by applying image effects, ensuring that important stones were sharp and commanded attention. Crystal and her team went right to work, meticulously masking out diamond areas, adding Photoshop filters and enhancing color effects. She then contacted her print broker, Steve, at Precise Printing Network and requested a sample proof and a quote for her 10 11x17˝ signatures, finished to 1,000 8.5x11˝ saddle stitched, 40-page catalogs. Pleased with the color and print quality of her proof, Crystal’s order was placed with Total Printing Systems in Illinois. It was printed on a Screen 520 using aqueous dye ink on 71# Mitsubishi Gloss coated stock. I asked Crystal a little while later, what she would have done differently. This is the excitement and education we need to move forward in this industry. Crystal took a chance in moving such a highly detailed catalog to inkjet. Attention: Designers, print brokers, printers or buyers. Do you have products that you have printed via aqueous dye or pigment high-speed inkjet that you are especially proud of and would like to share? Let’s talk; I would like to see and hear about your successes using inkjet. It is stories like this that we all should celebrate.